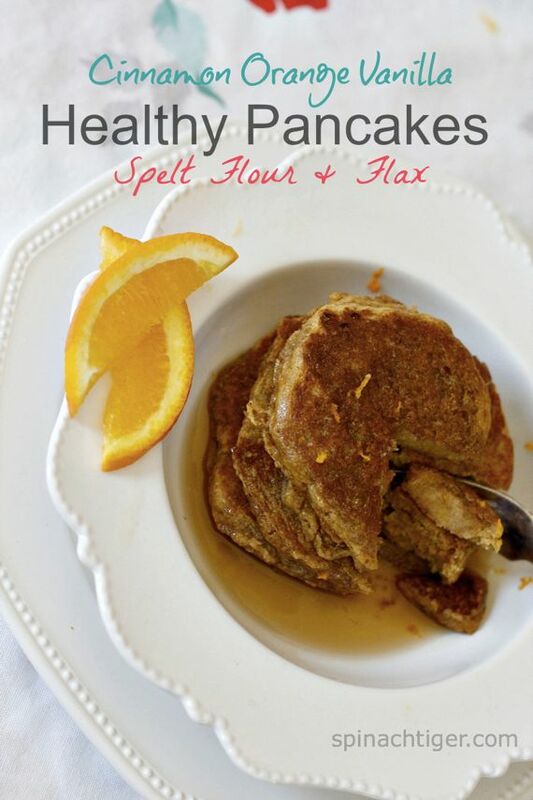 Spelt and Flax come together with awesome orange cinnamon flavor for a healthy pancake. Adapted from the recipe from brand, Flax USA. Mix the dry ingredients together in one bowl. Mix in orange zest. Mix egg, buttermilk, oil, vanilla in another bowl. Pour the liquid into the dry ingredients. Mix. Batter will be thick. Heat a griddle or seasoned cast iron pan on medium heat. Use a paper towel to wipe on some oil. There should be no oil puddling. Cook pancakes, turning the heat down. Turn when edges appear cooked. You might have to do a practice pancake to see how your stove and pan work with this batter. Serve with additional orange zest and maple syrup.